COMBES — Bernard Rowland, 77, a Lasara crop duster and owner of Rowland Dusters, died yesterday morning after his aircraft struck a power line in a field located along U.S. Highway 77 and Orphanage Road, according to authorities. Sgt. Maria Montalvo, spokesperson for the Texas Department of Public Safety, reported authorities received a call at approximately 10:42 a.m. concerning the fatal crash. 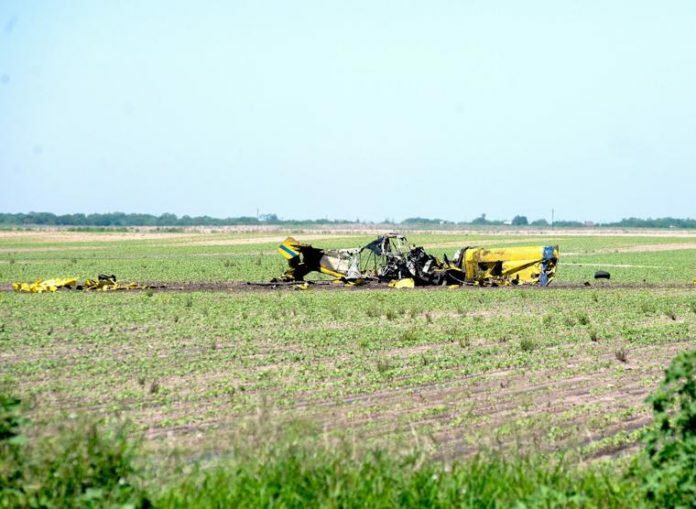 The single-engine crop duster crashed into the field about 10 miles northwest of Harlingen and was destroyed by fire after striking the power lines, according to Lynn Lunsford, spokesman for the Federal Aviation Administration. Lunsford confirmed FAA investigators were on their way to the accident site, and the National Transportation Safety Board will be in charge of the investigation. After responding to the site of the crash, Texas DPS troopers and officers with the Texas Parks and Wildlife Department worked to clear the area and secure the scene due to the pesticide chemicals that were spilled. An AEP spokesperson also confirmed the area experienced a brief power outage lasting no more than five minutes that affected approximately 5,000 customers.